Can U.S. Baseball Diplomacy Get the Save in Nicaragua? Any kid who has ever oiled a baseball glove in February while wishing the snow would melt  or an adult who still cries every time Field of Dreams is shown on cable  knows that baseball is far more than just a game. And the U.S. government is starting to recognize that it can harness the national pastime's awesome power as a public-diplomacy tool in tricky parts of the world where traditional efforts have been met with  well, traditional results. Last month, 56 U.S. softball players traveled to Cuba for a series of goodwill games that probably did more for America's public image on the island than any single political effort over the past 50 years. 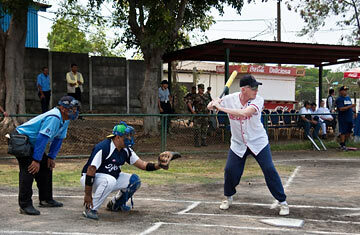 And in Nicaragua, where political relations with the U.S. have frayed ever since former revolutionary Daniel Ortega returned to power in 2007, U.S. ambassador Robert Callahan has discovered he can do some of his best work wearing a baseball mitt. "I think the State Department is coming to realize, belatedly, that [baseball] can be a very effective tool in public diplomacy," Callahan told TIME. In the case of the U.S. and Nicaragua, he said, "of all the things that unite us, I think the great sport of baseball is the most important." A long-suffering Cubs fan who played Division III college ball, Callahan now plays first base for the embassy's softball team, Los Cañoneros. As team captain, he batted a respectable .347 this season. "I guess for a guy who's 60, that's not bad. But I've got no power anymore, and I can't run." But Callahan can still hustle, which he demonstrated on several occasions off the diamond in recent months when forced to make quick escapes from Sandinista mobs. Leaders of Nicaragua's ruling party declared Callahan persona non grata last October after he gave a speech reiterating U.S. concern about the Sandinistas' judicial power play to green-light Ortega's re-election bid in 2011, despite a constitutional ban prohibiting it. Following Callahan's Oct. 28 speech, hundreds of Ortega supporters attacked the U.S. embassy with rocks, eggs and improvised explosives fired from homemade mortars, which packed enough punch to break bulletproof windows. For several weeks afterwards, Sandinistas continued to hound Callahan, surrounding him at public events and forcing him to flee  on one occasion with the help of riot police. Still, Callahan hasn't let his off-field problems rattle his game. After getting dusted, he stepped back in the batter's box and in the process may have won some sandlot cred with a segment of Nicaraguans not normally reached via traditional suit-and-tie diplomacy. "People see me on TV playing softball and they think, 'He's not so bad. He's out there playing ball with the guys  I mean, he can't be that bad, no matter what the government says about him,' " Callahan says with a laugh. To help his Mr. Baseball image, Callahan keeps several boxes of new baseballs (printed with U.S. and Nicaraguan flags) in his embassy vehicle so he can toss out a few to kids playing pickup games in roadside fields. Baseball has even helped Callahan score some points with government officials who call him a "yanqui imperialista" in public. At a recent private event, Sandinista hard-liner Comandante Bayardo Arce, who's also president of the Nicaraguan Professional Baseball League, reportedly practiced some baseball diplomacy of his own with Callahan. "He puts his arm around me and says, in front of all the Sandinistas, 'This is my amigo from baseball  we share the love for the great sport of baseball,' " the ambassador said. However, he added, baseball is the only thing he and the former revolutionary can talk about ... at least politely. "Three minutes into politics, and we yell at each other." Sometimes, of course, baseball and politics don't mix. When U.S. public-diplomacy envoy Cal Ripken Jr. visited Nicaragua last year, the Hall of Fame shortstop was forced to cut short his baseball clinics because of postelectoral political riots. But that hasn't soured interest in developing baseball here. On Dec. 17, former Major League greats Dave Stewart and Reggie Smith visited to announce that Nicaragua will be home to the International Baseball Association's first baseball academy in Central America. Smith, longtime player who has since coached Team USA baseball teams, said the association considered locations in Guatemala and Costa Rica but decided on Nicaragua because "here they have the passion and a natural talent for the game, and we won't be competing with soccer." The academy, which will be similar to the ones that have groomed so many big-name talents in the Dominican Republic over the past 30 years, hopes to help Nicaragua, which has produced only 11 big-leaguers, reach its potential as the next great baseball nation. And once there are 20 or 30 Nicaraguans playing in the majors, this impoverished Central American nation will be able to conduct its own baseball diplomacy with young fans across America. Read "How Politics Took Down Nicaragua's Boxing Champ." Read "Nicaragua: Where Every Day Is Christmas."